For three devoted days in August, Entravision executed a full broadcast takeover to raise $3 Million for the Children’s Miracle Network Hospitals. 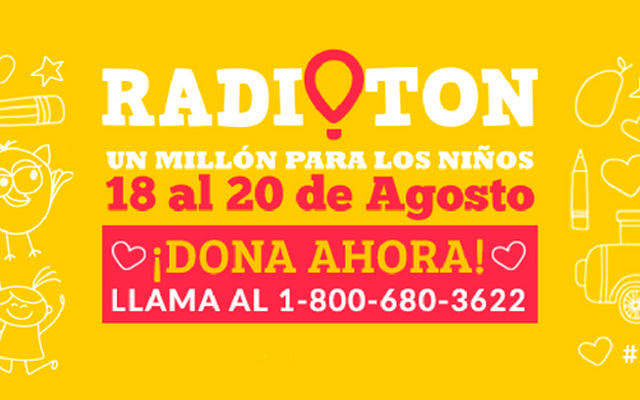 This was the highest tally raised in Entravision’s nine year Radioton history and will benefit over 95 communities nationwide. The donations will be utilized by local children’s hospitals to help fund critical treatments, health care services, pediatric medical equipment, and charitable care, as well as to provide treatment for low-income patients. “Our ninth Radioton in collaboration with Children’s Miracle Network Hospitals was a thrilling event for our entire organization, highlighting the dedication of our employees and listeners. Our participation in raising funds for this amazing charity is a means of giving back to the local communities we serve, and its continued success reflects Entravision’s ability to reach and engage Hispanics across acculturation levels and media platforms,” said Jeffery Liberman, Entravision’s Chief Operating Officer. The 72-hr broadcast kicked off on Thursday, August 18th, on Entravision’s leading network radio formats across the U.S. (José, Super Estrella, and La Tricolor). It included live-broadcast performances at the Children’s Hospital Los Angeles, featuring radio personalities from Entravision’s syndicated shows: Erazno y La Chokolata, Alex ‘El Genio’ Lucas, Armida y la Flaka, Piolín, The LM Show, and others who rallied listeners into supporting and donating to the cause.